On November 14, 2017, four decades of continuous production of the Fighting Falcon (F16) ceased at Fort Worth, Texas.1 The facilities are being relocated to South Carolina and would take approximately two years to become fully functional. They will provide maintenance support for the existing fleet of F16s till their phase out. So far, Lockheed Martin, the company that now owns the F16, in conjunction with multiple production lines in Belgium, the Netherlands, Turkey, Japan and South Korea, has delivered 4588 F16s to 26 countries.2 An order of 16 aircraft for Bahrain3 and upgrade work for Singapore’s F16 fleet will stretch the manufacturing and upgrade facilities till 2023.4 The rate of phase out of the F16’s existing inventory has been much faster than its production for over a decade. With no further orders, the F16 may gradually fly into oblivion. The F16 is a product of the Light Weight Fighter programme launched in the 1970's. The operational necessity was to outmatch the Soviet workhorse MiG21 in terms of combat manoeuvre. A number of novel concepts were incorporated in the design and later production models of the F16 including bubble single frame canopy, side-mounted control stick and the 30 degree reclined pilot seat. However, it was the concept of relaxed static stability in combination with Fly By Wire (FBW) and a very powerful power plant that made the F16 the pioneer of the 9G club.5 Its induction into the United States Air Force (USAF) in 1979 was followed by induction in the air forces of various NATO partners from 1980 onwards. Gradually, its export to a large number of countries in Asia was permitted. Post-Saddam Iraq is the latest recipient of this aircraft. The combat aircraft inventory in the world has changed in the last five decades. From a peak of over 38,000 in 1988,6 it declined substantially after the end of the Cold War. Currently, there are 79 types of over 16,275 combat aircraft operational in the world.7 In the period after the Vietnam War, the MiG21 was the most popular combat aircraft in terms of numbers. It was closely followed by mass-produced Chinese J6 (MiG19). Over 11,400 MiG21s produced in the erstwhile USSR along with those licence-built in India and Czechoslovakia were deployed in nearly 60 countries. But in the last three decades, the predominance of the MiG21 and J6 has been replaced by that of the F16, F18, and F15 aircraft. These three types originated in the USA and now form 30 per cent of the combat aircraft inventory in the world. 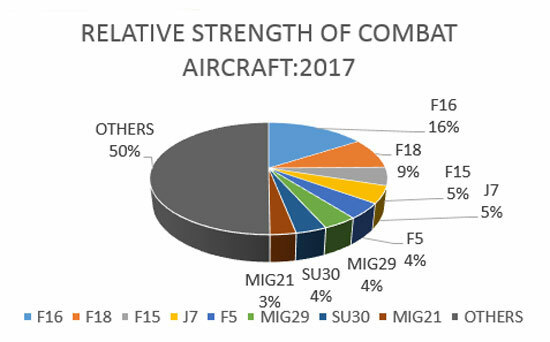 The F16 is at pole position with a 16 per cent share, as shown in Graph I.8 Although the number of F16s produced pale in comparison to that of MiG21, the former has had considerable impact on the prevalent operational environment. Had it not been for strict US government control on the sale of military hardware, the F16 would have found a larger market because of its combat capability. In fact, it was offered to India for the first time 25 years after its induction in the USAF. Source: Based on data in International Institute for Strategic Studies (IISS), Military Balance 2017, London: Routledge, Chapman & Hall, 2017. Source: Based on data in International Institute for Strategic Studies (IISS), Military Balance, London: Routledge, Chapman & Hall (from 1983 to 2017). The F16 commenced its operational employment journey with a disruptive relaxed static stability design that provided it with the requisite manoeuvrability to outmatch its peers in aerial combat. This, in combination with its sensor-weapon package, proved highly suitable for aerial warfare in the last quarter of the 20th century. With the development of long-range electronic sensors and associated long range weapons for aerial combat and air defence, manoeuvrability became secondary to low observability as the core capability of a combat platform. Stealth technology found its way into operational employment with the F117, but it came with a severe limitation in terms of speed. The aircraft was subsonic with 0.92 Mach as its top speed. But the F22 (2.0 Mach +) and F35 (1.6 Mach) have overcome this speed limitation and are set to become the mainstay combat platform in place of the F16. While it is possible to upgrade the power plant, avionics and weapons in the F16 to match the capability of the F35, the latter’s low observability cannot be matched as the basic design of the F16 is not in coherence with the stealth concept. The F16’s metallic body, shape, edges and external weapons result in a large Radar Cross Section (RCS), obviating low observability so essential in the current and future operational environment. Thus, the F35 of Lockheed Martin, with its stealth design, is set to become the combat aircraft in the leading position. 46 of these aircraft were delivered in 2016 and production picked up further to 66 in 2017.11 The F35 production schedule is expected to run for another two decades with three production lines (Forth Worth, Texas, USA; Cameri, Italy and Najoya, Japan) and an estimated strength of nearly 3000, with the United States Air Force, United States Navy and United States Marines Corps as the main users along with Australia, Japan, Israel, Turkey, UK, Denmark, Netherlands and South Korea. The momentum of production of the F35 will practically guide the phasing out pace of the F16. In the next decade, the operational inventory of the F16 is expected to reduce by half and the aircraft is likely to be phased out in another decade on completion of TTL or drying up of spare parts for the last set of eight aircraft delivered to Iraq in 201712 and the 16 aircraft that Bahrain is planning to acquire. The Indian Air Force (IAF) is currently looking for over 100 single-engine combat aircraft and the F16 is in the fray along with SAAB Gripen. An order of this magnitude would be a lifeline for F16 production and enable the setting up of production facilities in India. Going by historical experience, aircraft selection for the IAF will be a time-consuming process and the conclusion of the contract may take even longer. Considering the significance attached to the ‘Make in India" initiative, a gradual increase in the production of the Light Combat Aircraft (LCA), and the diminishing operational relevance of the F16, it may be curtains for the Fighting Falcon for the time being. The F16 had participated in the IAF’s now scrapped 126 Medium Multi Role Combat Aircraft (MMRCA) acquisition process. It failed. Will it be lucky this time with the Block 70 version? It literally is a multibillion dollar question. The F16 redefined manoeuvrability and remained a potent platform for nearly four decades. It will continue to remain operationally relevant in a low technology environment for another decade. However, the proliferation of stealth technology will diminish its relevance and maintenance imperatives will push it towards extinction. Irrespective of whether the IAF acquires the F16or not, it is certain that this legendary aircraft is slipping into oblivion. We, at this juncture, are witnessing the beginning of the end of an era. 1. Max B. Baker, “How the F-16 fighter jet put Fort Worth on the Aerospace Map,” Star-Telegram, November 24, 2017, available at http://www.star-telegram.com/news/business/aviation/article186288298.html, accessed on January 18, 2018. 3. Sujay Mehdudia, “Bahrain Buys 16 Latest F16 Combat Aircraft,” India Strategic, Vol. 12, Issue 11, November 2017, p. 26. 4. Lockheed Martin Cooperation, Annual Report 2015, p. 32, available at https://www.lockheedmartin.com/content/dam/lockheed/data/corporate/docum..., accessed on January 18, 2018. 5. An aircraft that can sustain nine times the gravitational force (g) in a level turn are nominally members of the 9G Club. High g during turns leads to smaller radius and larger rate of turn - an asset during close combat. MiG29, Su30, F22 and F35 are some aircraft capable of 9g manoeuvres. https://www.flightglobal.com/news/articles/lockheed-meets-2017-f-35-delivery-goal-444363/, accessed on January 18, 2018. 12. Lockheed Martin Cooperation, Annual Report 2016, p. 4, available at https://www.lockheedmartin.com/content/dam/lockheed/data/corporate/documents/2016-annual-report.pdf, accessed on January 18, 2018.